The maximum number of varsity games, contests or playing dates an institution may schedule is listed below. 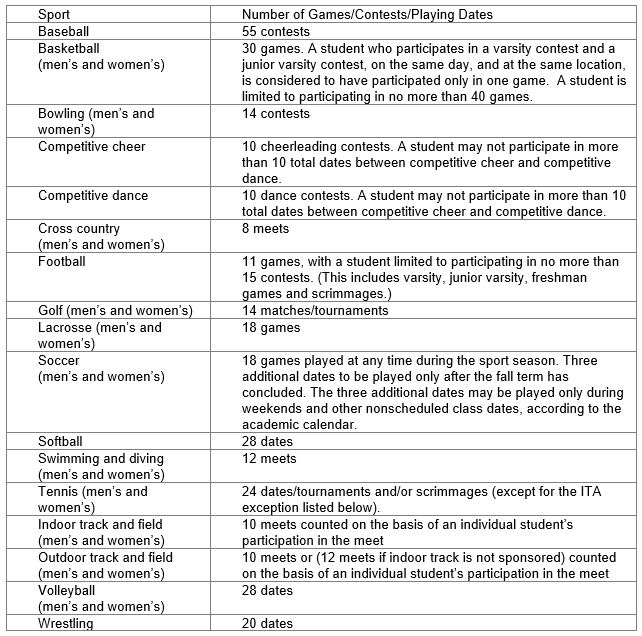 The number of junior varsity or freshman games, contests or playing dates scheduled during the academic year cannot exceed the number of varsity games, contests or playing dates scheduled during that academic year. 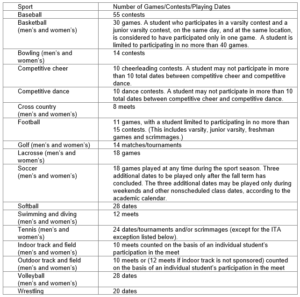 Further, no student may compete in a sport in an academic year in more than the number of games, contests or playing dates listed below (this includes varsity, junior varsity, freshman, etc. ), excluding NAIA-approved postseason participation. For a contest of any kind (i.e. scrimmage, exhibition, game/meet, etc. ), once the contest has commenced the designation of the type of contest will be officially recorded as such, and the designation cannot be changed retroactively. In the sports of baseball, cross country, golf, lacrosse, soccer, softball, swimming and diving, tennis, indoor track, outdoor track, volleyball and wrestling, an institution is allowed one exhibition competition per season. In the sport of competitive cheer and dance, an institution is allowed one cheer exhibition competition and one dance exhibition competition per season. The competition must meet the definition of an exhibition under Article V, Section B, item 6 of the NAIA bylaws. The exhibition competition will count as one varsity game, contest or playing date within the limits stated above. Exhibition competition is not allowed in the sport of football. For the sport of basketball, an institution is allowed one or more exhibition competitions per season so long as the total number of games, exhibitions and scrimmages does not exceed 32. For the sport of basketball, an exhibition competition will not count as a varsity game. EXCEPTION: In the sport of tennis, the Fall ITA regional and national singles and doubles tournaments shall not count towards the student’s playing limits. 2. The following number of scrimmage dates per sport will be allowed in addition to the maximum number of varsity games, contests or playing dates which an institution may schedule or in/on which a student may compete. Intent: To establish one date as the number of additional scrimmage dates in which both competitive cheer and competitive dance teams may participate during an academic year, beyond the 10 competitive cheer and 10 competitive dance contests provided for in Article I, Section G, Item 1.